SWOOOOON !! Have you seen those beauties yet? LOVE, LOVE, LOVE. I am sooo bad I spent a fortune so far on mini goodies but then that's why I joined up so I can make enough money to spend as I wished on what I wished so that I do LOL. I was looking at them the other day and wondered what I could use them on and yes I will be sewing some on a lovely cardi's and I will be making one of those mini books that lovely Dawn has showcased but till then I chose to make a book mark. I like to read not reading half as much as used to but I do occasionally and while I made plenty bookmarks for others never made one for myself would you believe it. Until now that is. So I set to work and pleased myself with Rose Red, Tempting Turquoise Olive and Chocolate. Yum indeed. The branch is from the infamous and very popular 2 step bird punch and the sweet pea felt floweries beauties. Pink Passion, Summer Sun, Bashful Blue and Choc Chip plus THE BIRD!! this lovely, lovely bird. 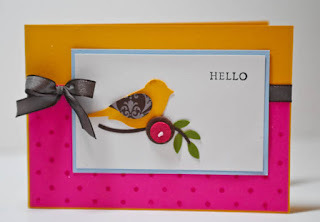 I have also used the Polka Dot big Background stamp and the elegant flourish from the new Label set to add details to the wing. The branch was layered with Choc Chip and Old Olive. I punched them out in one colours each and trimmed the leaves away for the chocolate one. Oh I love those sweet flowers too Monica I'm gonna be ordering them soon. And I just love your card. Love that colour combo too. My favourite colour is the pink passion I use it for so many things. Is it true SU are discontinuing some colours? From what I hear my favourite ones are being replaced. I'm gonna have to stock up! What a gorgeous bookmark I love love love it! what a beautyful bookmark!!! Love this idea! super bright and cheerful card to. What a lush bookmark!! hope you had a good holiday you deserved it! thanks for the choccies! very indulgent for me on my diet! hope you liked the littel gift too! hi Monica, first time here.. the bookmark sooooooooooo sweetttttttttt. love it..